Rachel Corrie was a U.S. citizen and a human rights defender committed to ending Israel’s illegal demolition of Palestinian homes. According to the Israeli Committee against House Demolitions,Israel has demolished an estimated 27,000 Palestinian structures in Occupied Palestinian Territory since 1967. Rachel was killed by the Israeli military with a U.S.-taxpayer funded Caterpillar D9 bulldozer on March 16, 2003, in Rafah, in the Gaza Strip, while seeking to protect the home of a Palestinian family from demolition. In August 2012, a civil case in Israeli court against the Israeli military filed by the Corrie family concluded with the presiding judge not only absolving the State of Israel of any liability, but also blaming Rachel for her own death. This is unacceptable. Take action today by signing this petition launched by us and our friends at the Center for Constitutional Rights urging the U.S. government to conduct investigations into all cases of Israel severely injuring or killing U.S. human rights defenders. The U.S. government has long maintained that the Israeli military’s investigation into Rachel’s death was not thorough, credible, and transparent. The Israeli court’s verdict has only reinforced the fact that Israel is incapable of investigating and holding itself accountable for killing Rachel and severely injuring and killing other U.S. human rights defenders. Recently, member groups around the country took action during the Rachel Corrie Week of Action surrounding the verdict, focused on building the We Divest Campaign, which calls on financial giant TIAA-CREF to divest from companies involved in the Israeli occupation, including Caterpillar.On Hilton Head Island, South Carolina, activists from member group Hilton Head for Peace held a vigil to honor Rachel’s life and work for justice. 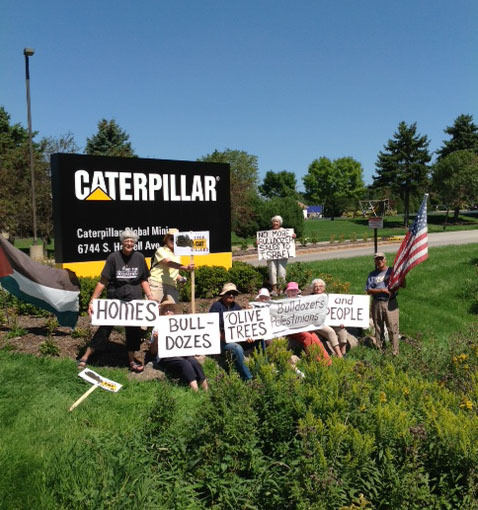 In Oak Creek, Wisconsin, member group Friends of Palestine demonstrated and performed street theatre at Caterpillar’s Mining Operations Headquarter. Member groups around the country took action for Rachel. Other activists and member groups in Honolulu, HI; Boca Raton, FL; Houston, TX; Phoenix, AZ; Philadelphia, PA; St. Louis, MO; Eureka, Palo Alto, Los Angeles, and San Francisco, CA; and Chicago, IL held other actions around the country outside of Caterpillar dealerships, an Israeli Consulate, TIAA-CREF offices. US Campaign members joinred others in Washington, D.C. in a demonstration outside the State Department. You can see photos of many of the actions here. Other U.S. activists focused on social media. On the day of the verdict and the day after, #RachelCorrie and #divest4justice trended among the top ten most popular hashtags. And more than one hundred individuals worldwide posted photos in solidarity with Rachel and her family on this Tumblr blog. Whether or not you were able to take action during the Week of Action, please take action today by signing this petition calling for a U.S. investigation now. “I don't think that Rachel should have moved. I think we should all have been standing there with her,” said Cindy Corrie in response to Judge Gershon's comment that Rachel should have moved out of the way of the Caterpillar bulldozer. Rachel wrote from Gaza, “The international media and our government are not going to tell us that we are effective, important, justified in our work, courageous, intelligent, valuable. We have to do that for each other, and one way we can do that is by continuing our work, visibly.” May we continue to take Rachel’s words to heart, find ways to successfully mobilize ourselves, strengthen our networks, utilize new forms of communicating to affirm the just cause of the Palestinian people and stand with the movement for universal human rights in Palestine and Israel. Please honor Rachel’s life and legacy by signing this petition today. Together we’ll deliver the petition to the State Department next month. Help us reach our goal of 10,000 signatures by signing right now and spreading the word!